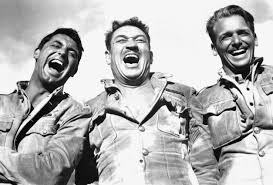 “Gunga Din” is like one of those films that claims to fit into every genre, but doesn’t do any of them very well. A jack of all trades, but a master of none. It’s a historical piece set in 1880s India, but does very little to capture the look and feel of the era. It has Cary Grant in a leading comedic role, but he often feels awkward and doesn’t get good reactions from the rest of the cast. It has large battle scenes, but they feel unimpressive even for its time. It has a romance with Joan Fontaine as practically the only female in the movie, and it often feels like an after thought to the filmmakers. Together, this makes for an epic that is at serviceable and best and boring at worst. Not one I’d put on again, but not terrible either.